But as I grew, my interests shifted. I traded the meadow for well-manicured athletic fields and our old pond for swimming pools. My interest in my Central Texas natural surroundings paused around 8 years old. I never figured out what species of oak provided teacups for my parties, only that the caps were nicely proportioned for fairies. Neither did I learn what type of moss my fairies used for seat cushions, only that it opened into minute stars under sprinkled water. I’m embarrassed now, as a naturalist, to admit that I don’t know even some of the most common species of my home state. This lack of knowledge, however, offers opportunity when I return to Texas from Vermont, the home of my formal ecological education. As I walk old trails and come across a familiar (yet unknown) tree, my inclination is to turn to field guides or a trusted expert to tell me what to call it, who eats it, and what it might reveal about the soil beneath it. In Vermont, I have had a string of wonderful professors and peers to teach me about the natural world, assisted, of course, by an ever-growing library of field guides. I hope to be so lucky again in Texas. This time around, however, I am resisting my urge to immediately consult the experts. I am allowing myself to make a few discoveries. So today I went for a walk not with my field guides, but with a pair of scissors and my mom, who admires nature through eyes much more artistic than my own. We collected a few specimens, returned to our kitchen table, and settled in with our pencils, watercolors, and tea. I chose specimens that were familiar from childhood memories, but not known to me as a naturalist. I watched my mom lovingly render each thorn on a briar that had caused me many childhood tears. My old hatred melted into fascination, then respect. Inspired, I shifted my focus to the specimens before me. I found that Texas mountain laurel—whose “hot beans,” my brothers knew, heat up enough when rubbed on rough stone to induce shrieks from little sisters—holds its leaves into late December. The terminal leaflet, at least in the sample I selected, lists to one side. The woody, wrinkled seedpods are difficult to open before their time and the beans within, fire engine red in my memory, can also be nearly black. 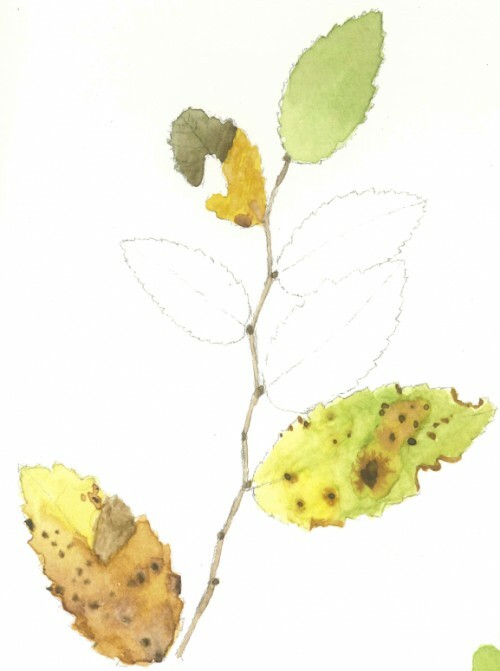 As I sketched a species of elm, whose name I do not know, but which grew in the front yard of my childhood home, I noted that the bases of the small leaves are not dramatically asymmetrical like the Vermont species of elm. The delicate twigs of a sapling bend substantially at each minuscule leaf bud. Both the green and yellow leaves are sandpapery. The largest brown patches appeared confined by the leaves’ venation. Perhaps I could have learned most of this from a book, a class, or a friend. I would have missed some details, though, along with an opportunity for connection. Often as a naturalist I have learned only the characteristics that will allow me to distinguish one plant from others. This is, of course, useful. However, we protect what we care about and we care more when we have some sense of ownership or a personal connection beyond a collection of facts. So today, with my mom, I wanted to get to know my childhood acquaintances more intimately, moving past the strictly functional. I wanted to find companions for my fairy teacups and warm eggs. While it may not be a skill to add to my resume, I know that this afternoon spent sketching with my mom has made me a more inspired steward of the world around me. In addition to being a Field Naturalist and Ecological Planning student, Clare Crosby is a connoisseur of board games. 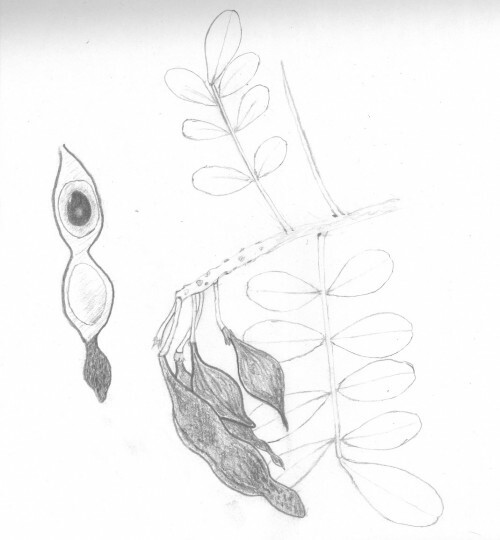 This entry was posted in Botany, Discoveries, Experience. Bookmark the permalink. From one who has known you from your early naturalist years, I find this blog heartwarming, peaceful, thoughtful, happy and encouraging. I delight with you in the spark of new discoveries and beginnings.